After all of my simple pencil pouches and peasant dress sewing for the craft fair, I’m enjoying sinking my sewing teeth into a project with more demands, details , and learning opportunities. I agreed to sew a First Communion dress to donate to the school auction tomorrow night, and after spending hours wondering if I should make my own pattern and looking at patterns online, I found a vintage 1958 sewing pattern on Etsy that I felt was perfect for what I wanted to try. I’ve never done tucks or any type of heirloom sewing so this pattern was a perfect fit for what I wanted to learn. I bought some lovely silk taffeta in downtown Los Angeles last week to use for it. 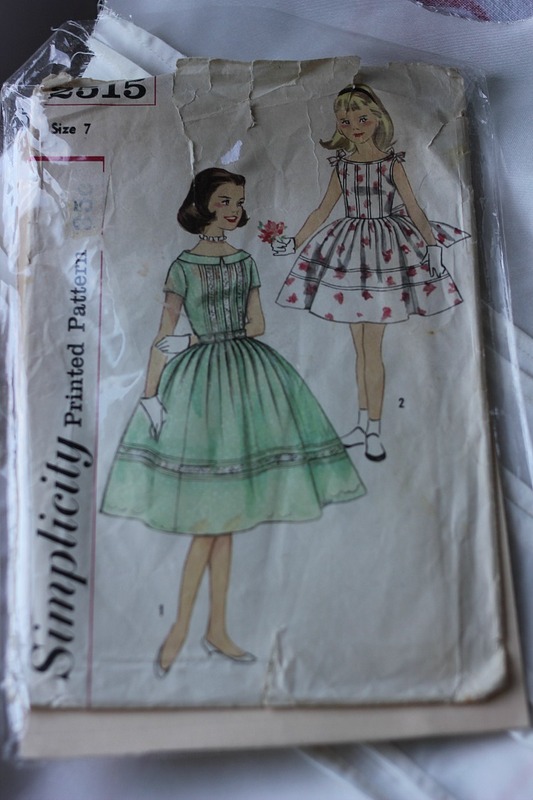 Whenever I want to improve my sewing skills, I get out one of my vintage patterns and my old sewing book. Many of the old techniques are hardly ever practiced anymore and every vintage project is a learning experience for me. This was the second bodice I made. The first turned out so horrible I almost gave up. Then, I somehow just got it. I love when that happens! Now I feel I can tuck until the cows come home! All was fine and dandy until I came to the sleeves…. 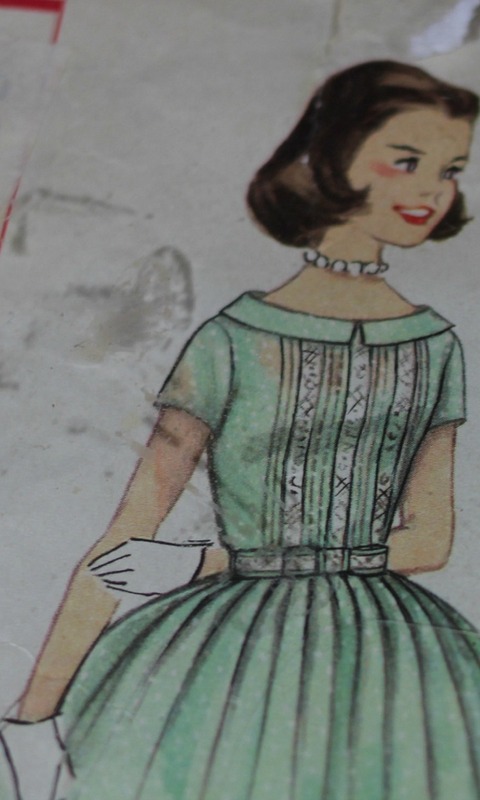 the pattern showed a smooth cap sleeve yet my sleeve was full of puckers and small gathers once I set it in. The culprit? Too much ease. Time to get the seam rippers out. Am I glad I bought a tiny, narrow needle. The marks won’t show through on the fabric as much. 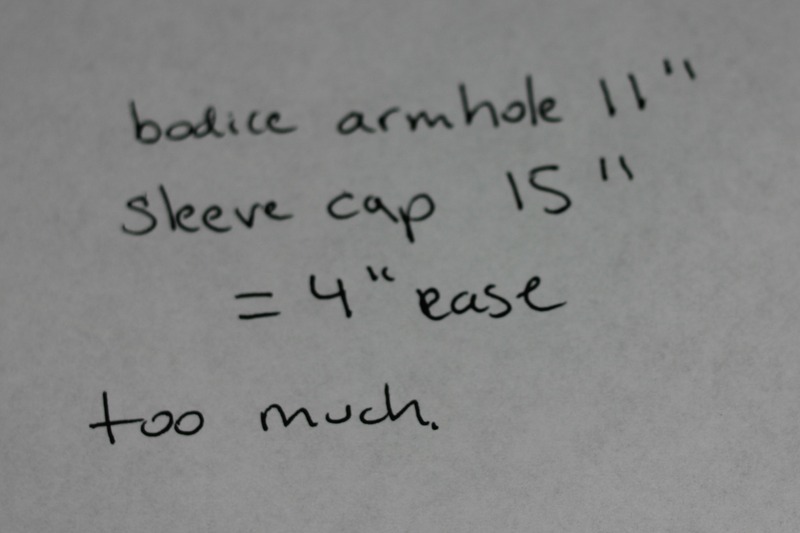 I measured the pattern armholes and then the sleeve armholes and compared them. There was 4 inches of ease! Way too much to have a smoothly set in sleeve. I would have to reduce the ease to about 1.5 inches by shaving off the cap . I drew how to below in blue pencil. A word of advice about sleeves…. always measure armholes to sleeves. If the sleeve is gathered it’s fine to have lots of ease, but anymore than two inches of ease for a smoothly set sleeve is going to give you trouble. 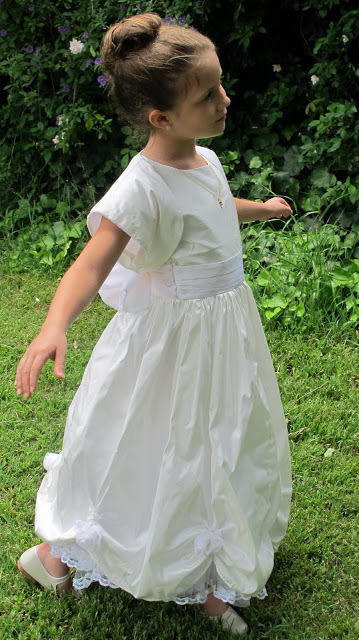 A Silk Taffeta First Communion Dress from a 1958 Pattern Refashioning Mom’s Wedding Gown Into A First Communion Dress- Finished! Finished First Communion Dress Raising armscye depth and removing height from sleeve caps for a better sleeve fit. Gorgeous! 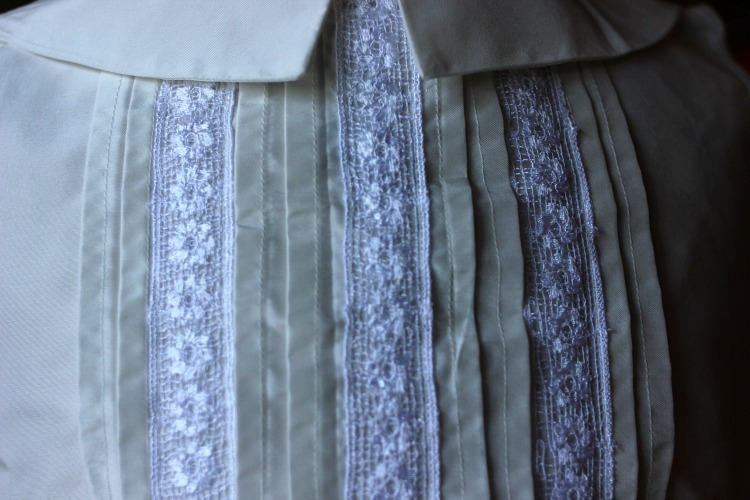 I love the tucks and lace details. What a gorgeous dress! Thank you for the tip about sleeve ease. I am anxious to put bunchy unintentionally puckered sleeves behind me. 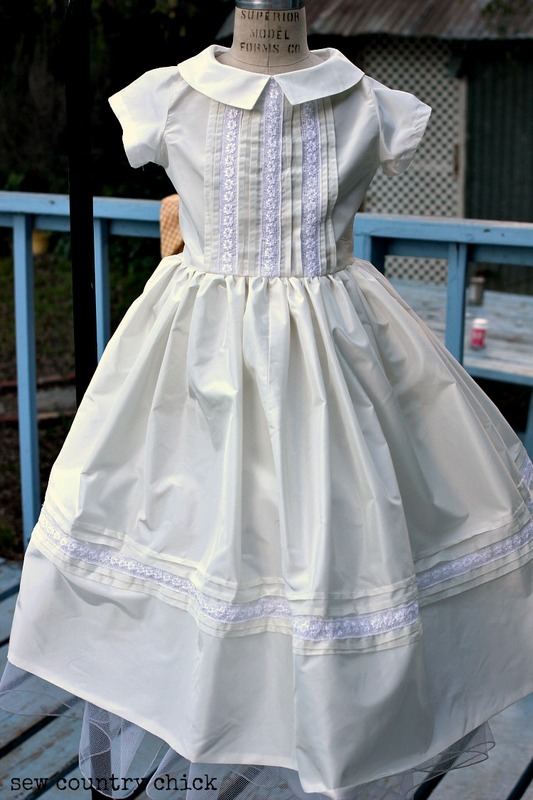 Theres a community on g+ called Couture Sewing. It doesn’t get a ton of posts because; like you said, a lot of the older techniques are dying. Every once in a while I get some beautiful heirloom sewing in my feed from that group. 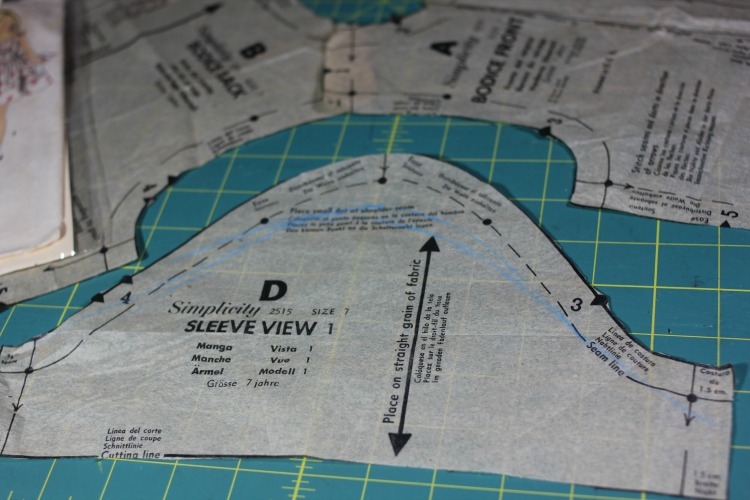 There’s another community called pattern Drafting something. I sent you invites to both, I don’t know if you’re already in them or not 🙂 I never have anything to post in there, but enjoy the stuff that I read. You make me wish I didn’t cheat my way through algebra. I’m pretty sure you just draw a line and measure, because you are an instinctive sewist…I’d have to hack and sew about 5 muslins though. Thanks Amy! I’d love to join those groups. I just joined tge American Sewing Guild and they have a couture sewing workshop every month nearb I cant wait to go to. Claire Schaeffer has an excellentbook called Couture Sewing if you are interested. Ive learned a lot just from the old patterns though. I’ll have to do a tutorial on the tucks. Once you figure it out,it’s easy andno I never use attachments. i can’t figure them out! And I have to use a presscloth because my iron has stains. 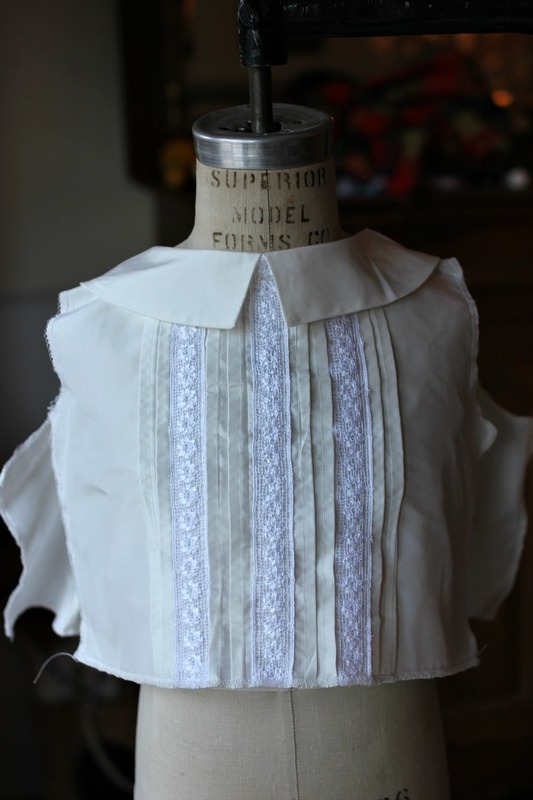 It’s going to be a gorgeous First Communion dress! Looks beautiful! I love your pattern choice, maybe I’m just old-fashioned but I’m not a fan of the First Communion dresses with spaghetti/no straps. 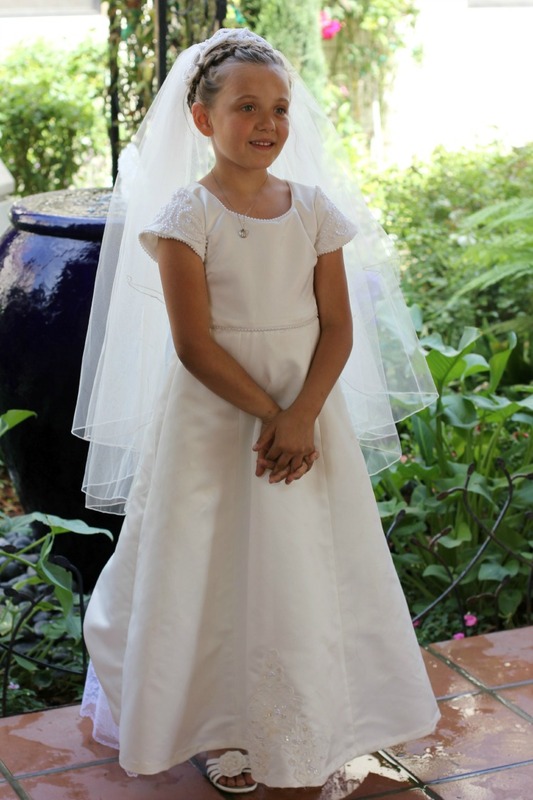 First Communion is a beautiful sacred moment, and the outfit you’re creating really shows that! For buttonholes, get a Pfaff, used or new. Mine does a great job. Good for you to tackle this project. Are you familiar with Gerties vogue sewing challenge and or book? There’s couture for you in her books. I used to be obsessed with her blog! I haven’t been sewing many vintage projects lately and am getting back into it. Love this dress. Would you take an order?